You've got to be careful when discussing Star Wars movies if you want to avoid spoilers, and that goes double for those involved in making them. So, Rogue One: A Star Wars Story director Gareth Edwards may be cursing himself right now for accidentally letting slip a certain character's name in a recent interview. The character in question is Grand Moff Tarkin, whose foul stench Princess Leia claims to have recognized when she was brought onboard the Death Star. While discussing Ben Mendelsohn's character Orson Krennic with USA Today, Edwards described him as a "working-class" figure who has ascended the ranks of the Empire, but still butts heads with his superiors. "[Krennic] hits a brick wall in the hierarchy where they won’t let him in the club and it’s going to turn into a them-or-us situation: either Krennic or Tarkin and the others," he said. And while this might sound like a purely hypothetical situation, there's a moment around 1:20 in the second Rogue One trailer that shows an Imperial officer with a head shape and hairline resembling Tarkin's moving toward Krennic. You don't typically give a dramatic shot like that to just anyone. So yeah, I buy it. So we've got Vader, Tarkin… anyone else wanna show up for this little reunion of the good ol' days? 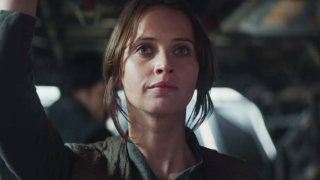 Directed by Gareth Edwards and starring Felicity Jones, Diego Luna, Ben Mendelsohn, Forest Whitaker, and Alan Tudyk, Rogue One: A Star Wars Story is scheduled to open in UK and US cinemas on December 16, 2016.